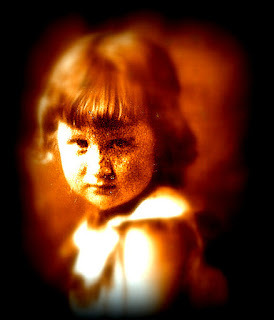 This is a picture of Mary Alice Muncy (at the time), later to be Mary Alice Greenwood, my mother. From what I understand, it was taken at a carnival. The shy, pensive look doesn’t appear to be of someone having fun at a county festival. Possibly, she had already developed an inkling of the tough life that was in store for her. I’ve played with the print a little. It was a cheap black and white they probably purchased for pennies. I can see the family resemblance, because, haughtily, it looks a lot like pictures from my own youth. She and her family were “Okies” who came to Socorro country from Lawton, Oklahoma. She had trouble collecting social security, because her birth certificate was destroyed in a courthouse fire. When she tried to obtain a copy, she discovered that it simply said “Baby Girl Muncy” because she was a preemie, and her parents didn’t name her right away, because they weren’t sure if she’d live. Many premature births didn’t in the early 1900’s to poor families. They swaddled her and placed her in their wood stove (no incubators for their likes) to keep her warm enough, and she pulled through to become the oldest sister in her family and later our loving mother. As a person ready to retire, she had to find several older Socorro matriarchs who could sign a document of identification and testifying to her age and such. She was a simple farmer’s daughter who saw that we were always loved—and that is stated on her tombstone in the Tatum cemetary. She was a humble person and a Bible verse that stuck in her mind and she spoke of was Mathew 24:40—“Then there shall be two men in the field; one will be taken, and one will be left. 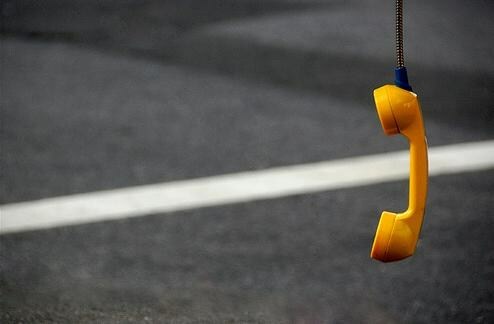 Being a humble person, she always felt she would be the one left behind in the field. But I know, if such a time came to pass, she would not be abandoned thus. She lived her life to earn the place as the one who would be taken. 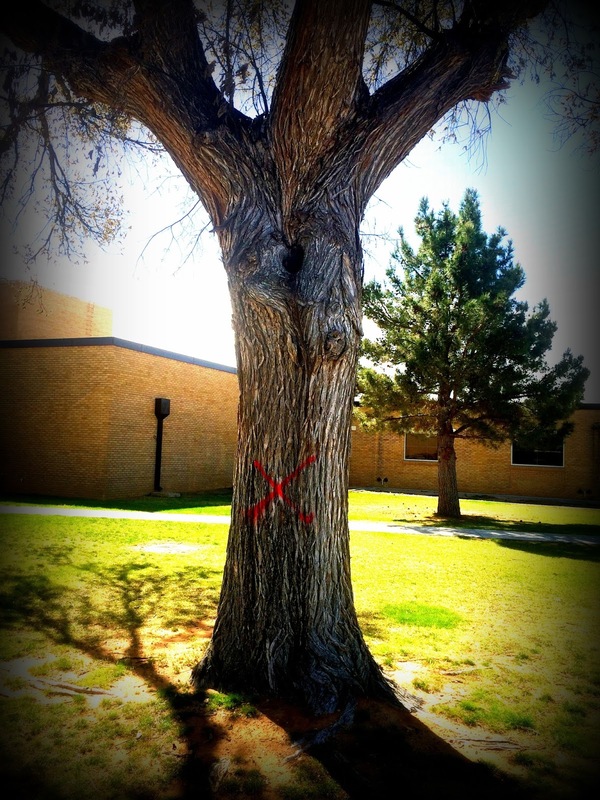 A tree apparently marked for removal outside our classroom at the high school. Most of us have taken biology and realize trees add a growth ring every year, so when sawed down one may count the rings to see how old the tree is. Some trees grow quickly and have soft wood. Some grow slowly and are sturdier. Rainy seasons are revealed through thicker rings. Sparse seasons of drought by thin rings of struggle. Soon one may peer down at this stump and estimate how long this magnificent one has poured a shady sanctuary over this campus spot. One can only imagine the teens and teachers, parents and visitors that strolled, walked, paused below its welcoming shade in summer or stared at its stark branches in winter. The happiness, sorrow, pride, anger, fear, joy it witnessed in its anthropomorphic stead. The squirrels and birds that scampered or nested in its branches. The leaves released each fall for maintenance workers to rake and janitors to sweep from the nearby sidewalks. Little fanfare will mark its demise. It sprouted from a tiny seed not much larger than the biblical mustard seed compared to man’s faith. It grew, weathered the ages, and eventually revealed the infirmities of age and disease that left it marked with its red X. Just another reminder of the temporality of life. Its lived a long time in our imagination. Scant time in the llano’s scheme of things. One might pause and note its presence before it is only seen in former campus pictures or a brief remembrances to those who leaned against its bark to study or chanced to kiss beneath its leafy arbor. Pause and note the trials, tribulations and moments of splendor that, like this tree, will soon be only past whisperings.